During the preliminary flat work session, Alice was able to get in control of her horse thanks to Michel's advice. However, her horse, Pharaon, still has a lot of energy, and gets excited around jumps. This kind of behaviour is most of the time reinforced by the rider’s physical and mind sets. The goal of this session is to channel this overflow of energy by riding with a position close to what Michel calls the perfect position. Michel noticed that Alice has a good position approaching fences but gets unbalanced over the fence: her hips move backwards and her legs forward…which results into a loss of control on landing. 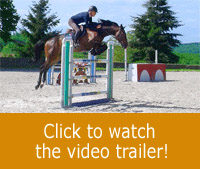 Michel will give her some tips that will help her maintain a good position before, over and after the jump. The jumping session starts with a set of cavalettis. Alice has to keep focusing on her position even if it means to let her horse speeding up for now. 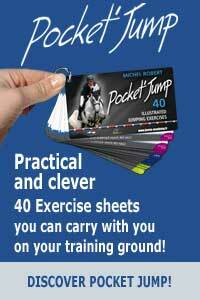 The priority is for the rider to be able to follow the movement over the jump without getting off balance nor interfering with her horse’s movement. The next exercise targets Alice’s position during the landing phase. It will help her absorb the jump using the motion of her joints -hips, knees, ankles. Michel stresses the importance for the rider to stay as symmetrical as possible on either side of her horse’s axis. The right side stays to the right of the horse, and the left side to his left. The session ends with jumping different profiles of natural fences: a bank, few verticals made with some logs. Once again, Alice has to stay focused on her position in order to be ready to cope with any situation.